Buddhist, Jewish, Muslim and Christian leaders will be calling on countries to ensure safe and legal pathways for migrants and refugees as well as inclusive societies and the right to remain at home. They will also be describing how organizations flowing from their faith traditions serve those in their places of origin, in transit, and destination. The conference featuring interfaith leaders will be held at the United Nations in New York on May 3 in the run up to intergovernmental talks later in May on improving the way the world assists migrants and refugees. The Sharing the Journey of Migrants and Refugees: An Interfaith Perspective on the Global Compacts event includes the Venerable Gijun Sugitani, Rabbi David Rosen, Sheikh Mohamad Abou Zeid, Metropolitan Emmanuel Adamakis and Cardinal Luis Antonio Tagle and will be chaired by Archbishop Bernardito Auza, Apostolic Nuncio and Permanent Observer of the Holy See to the United Nations. The panel is aimed at ensuring the UN Global Compacts on Refugees and Migrants respect the rights of all migrants and enshrine a shared responsibility for refugee reception. Caritas is concerned by the wide gap between what the Compacts say and the current policies and practises on the ground. Greater consistency between the two Compacts is also needed. They must ensure that no one is left behind, by creating legal pathways not just for asylum seekers, but for migrants in general. Shared responsibility in supporting refugees fleeing conflict, climate change and poverty must also be achieved. On child migration, Caritas believes, the best interest of the child should always come first. For this reason, the practice of detaining children on the basis of their or their parent’s migration status should be abolished. 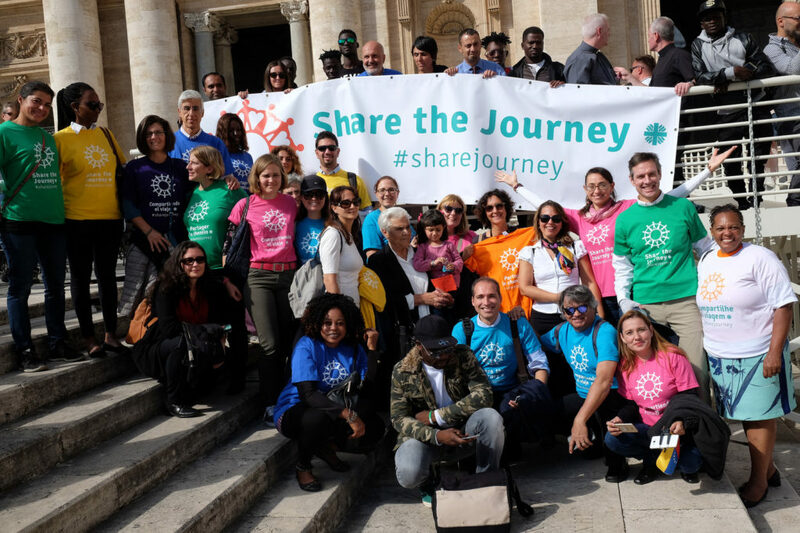 Pope Francis launched Caritas’ Share the Journey campaign in September 2017 to create opportunities for encounters between migrants and local communities around the world. Caritas believes that encounters not only contribute to changing the debate around migration, but also successfully break down fear and racism. To attend the panel, it is necessary to RSVP by April 30. The event will also be broadcast live via webtv.un.org.